The effect of the recent spates are clearly visible still on the banks of the River Nairn. They probably assisted the dead alder (pictured below and larger image here) in its fall into the river this week just below the railway bridge. Some alders on the river bank look to be in a poor condition, disease or simply old age perhaps but elsewhere, especially in the field below Firhall there is no shortage of younger trees coming up and growing several feet a year. The cycle of renewal continues with the tree that gave the town and the river its Gaelic name still very much in evidence. This fallen tree has also taken a younger sycamore down with it. 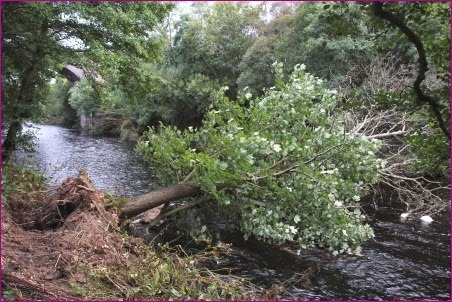 Genearlly fallen wood can be as useful to the riparian ecosystem as the living variety but it isn't much good when it lies across three quarters of the river. Nearby further erosion can be seen where the native flora has been squeezed out by Japenese Knotweed, a plant that does nothing to hold the riverbank together. "I notice that in addition to the main thrust of your campaign (the need for provision of access ramps), you make reference to safety, and to an observed “sag” in the bridge. I have crossed the bridge on numerous occasions, on that great walk up the River Nairn from the Harbour to Firhall, and Howford; most recently in late July. Be assured that the bridge is not unsafe to use, and members of the public are not in danger when crossing the bridge."